To mark International Day of Persons with Disabilities, the Assembly decided to do things a little differently this year by dedicating the day to providing accessible tours of Parliament Buildings for people with disabilities and additional needs. A few of the participants that took part in the accessible tour pictured with Michaela Boyle MLA (front row, left) and Gordon Lyons MLA (back row, left). The accessible tour is just one of a number of initiatives spearheaded by the Assembly to raise awareness amongst disability groups and individuals of the accessible services available at Parliament Buildings. It was also an important opportunity for us to encourage local people to visit the building, take part in the tours and to find out more about their building and its political, social and architectural history. The first tour of the day was tailored to meet the specific needs of those with learning difficulties. Delivered by the Assembly’s Education Service, the tour encompassed a small group to allow for greater one to one communication. It also focused on the use of accessible language and the opportunity for participants to ask questions, as well as the use of photographs and pictures to help tell the story of the Assembly and Parliament Buildings. Steven Agnew MLA speaks to tour participants in the Assembly Chamber. The next tour was specifically adapted for people with physical and sensory disabilities, focusing on the use of descriptive language and tactile aids to help participants get a better feel for and understanding of the building. A sign language interpreter was also on hand, as were additional Assembly Staff to help support those with mobility issues. The final tour was aimed at visitors with autism and was delivered and supported by Northern Ireland Assembly Autism Champions, members of staff who have been trained to understand the very particular needs of those with autism. The tour was again tailored for a smaller group in a less crowded environment and participants were given the opportunity to use the Assembly’s dedicated ‘Quiet Room’. 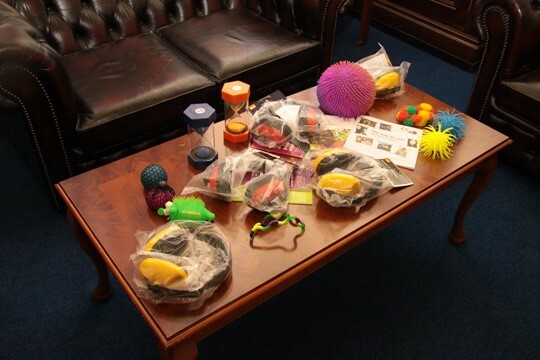 The Autism friendly 'Quiet Room' at Parliament Buildings. The feedback from the participating groups has been excellent and it is hoped that the accessible tour is something that we will be able to provide on a more regular basis in the future. Participants on the accessible tour learn more about the history of the Great Hall in Parliament Buildings. While Parliament Buildings is 86 years old, it has become a very modern space having undergone many adjustments to its physical structure over the years, including the construction of new wheelchair ramps, the fitting of electronic doors and the installation of a Changing Places toilet facility. As well as structural modifications, the Assembly has also worked hard to develop and sustain a range of initiatives aimed at making the building a more accessible and welcoming space for disabled visitors. 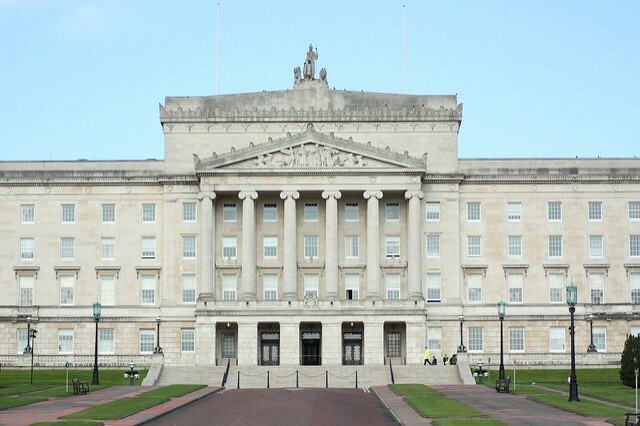 In 2012, the Northern Ireland Assembly received an Autism Access Award from the National Autistic Society, for our work on making Parliament Buildings an autism friendly venue. 10 members of staff have been trained as Autism Champions, to be a point of contact and support for visitors with autism. The Assembly has also been awarded the Action on Hearing Loss ‘Louder than Words’ charter mark, which recognises organisations that offer excellent services and accessibility for customers and staff who are deaf or have a hearing loss. Other initiatives include the installation of hearing loop, a Hearing Helper radio service and a braille tour guide and tactile map. Assembly staff have also been proactive in seeking additional training opportunities to improve their awareness and understanding of the needs of visitors with disabilities. Staff have taken part in deaf awareness and autism training and a small number are now in the process of studying towards a level 3 certificate in British Sign Language (BSL), having already successfully completed Levels 1 and 2. The Assembly is continually examining what more it can do to support people with disabilities and how to make their experience of engaging with the organisation as positive as possible. We have a range of equality policies in place and regularly consult with the Assembly’s Disability Advisory Group. You can find out more information here. If you are interested in visiting Parliament Buildings but have questions regarding access or you require additional support, you will find a range of information on our website. If you can’t find exactly what you’re looking for or have a specific query, you can contact our experienced Events Team at events@parliamentbuildings.org who will be happy to help.